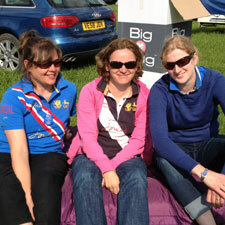 Julia’s role at Bramham – along with several other key team members, is to run the Public Campsite. They come in the week before and mark out all the pitches and generally get ready for the 300 plus caravans / tents / horseboxes that arrive for the event. During the event they are on hand to deal with any issue – these range from calling out the AA to attend to cars with flat batteries, helping people put up awnings, finding lost car keys and phones as well as where to get a gas bottles from! They also provide people with information on places to go and eat. As children, Julia’s Mum and Dad bought them to Bramham every year. They became the Caravan Stewards two years ago by default – her parents ran the campsite for some years beforehand but have now very subtly taken a step back…! The Caravan Team consists of – Chris and Julia Muir and Beverley Thorpe – and they are also supported by James and Sarah Hogg.